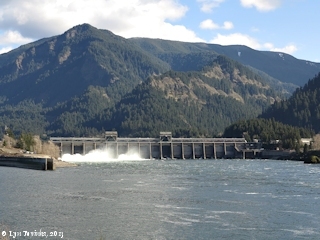 Click image to enlarge Bonneville Dam as seen from Hamilton Island, with Ruckel Creek drainage (behind left), un-named peak, and Eagle Creek drainage (behind right). Bonneville Dam as seen from Hamilton Island, accessed from Washington State Highway 14. Image taken February 19, 2013. Ruckel Creek is located on the Oregon side of the Columbia River at River Mile (RM) 147, upstream of Bonneville Dam. Downstream is Eagle Creek and Tanner Creek while upstream is the Oregon community of Cascade Locks. Ruckel Creek was named to honor J.S. Ruckel who helped build the 1850s portage tramway on the south side of the Columbia River, improving transportation around the Cascade Rapids. According to the Columbia River Basin Fish and Wildlife Program's website (2014), there are nineteen small rivers and creeks entering the Columbia River between the Bonneville Dam and Hood River, with the three largest drainages being Eagle Creek, Phelps Creek, and Herman Creek. The 4-mile-long Ruckel Creek is located just upstream of Eagle Creek and downstream of Herman Creek. 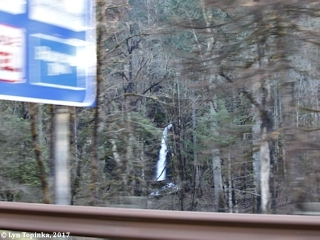 The lower 2.1 miles is intermittent with a 40-foot falls ("WaterfallsNorthwest.com" website lists height at 46 feet) located at Ruckel Creek Mile 0.2. 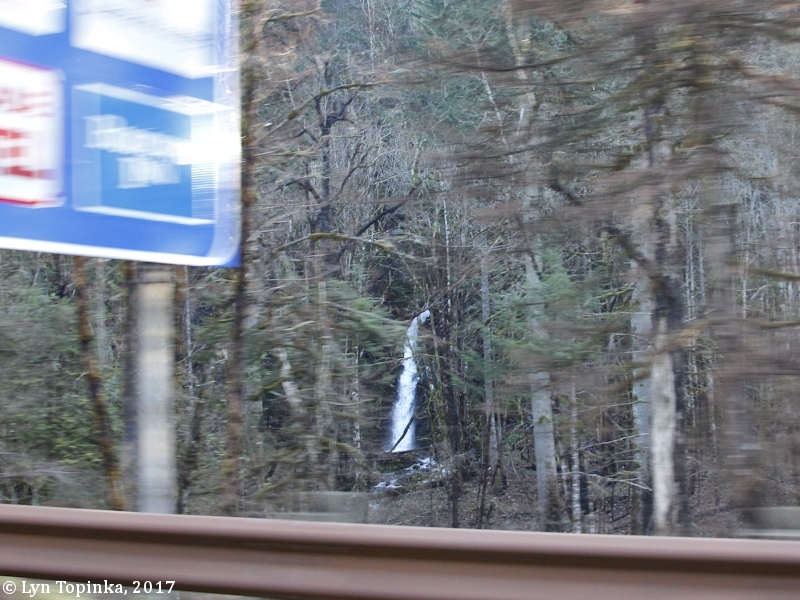 Click image to enlarge Ruckel Creek Falls as seen from Interstate 84. View from moving car heading east. Image taken December 6, 2017. Ruckel Creek was at one time called "Deadman Creek" or "Deadman's Creek". In 1915, with the construction of the Columbia River Highway, the creek was re-named to "Ruckel Creek" to honor J.S. Ruckel who helped build the 1850s portage tramway on the south side of the Columbia River. The tramway transported folks and goods around the Cascade Rapids. "The Committee felt that the name Deadman was not a good name for a natural feature, and the State Highway authorities wished a new name, There seemed to be no local sentiment about the matter, and the creek was therefore named ... for J.S. Ruckel, a pioneer transportation man who was interested in the first portage railroad at Cascade." ... Will G. Steel, Pres., Ore. Geographic Board. According to the U.S. Bureau of Land Management's General Land Office Records (GLO) database, Joseph S. Ruckel and Benjamin Jennings were granted title to 150.80 acres of T2N R7E, parts of sections 14 and 23, on September 20, 1861 (Military Warrant, Scrip Warrant Act of 1855). The 1860 cadastral survey map (tax map) shows a "Col. Buckle" residence located at "Middle Cascades, East". "The permanent settlement of Idaho territory began with the discovery of gold at Pierce City, on Oro Fino creek, in 1860. It was then a part of Washington Territory and the name "Idaho" was not known or applied at that time. The rush to these mines was made principally by the Columbia river route and so extensive did the traffic, carried on by river boats, become that a company was formed called the Oregon Steam Navigation company, of which Colonel J.S. Ruckel was a stockholder. One of the steamboats constructed by this company, plying on the Columbia river, was called the "Idaho," and launched in 1860." Source: John E. Rees, 1817, "Idaho - Meaning and Origin", IN: Oregon Historical Quarterly, vol.18. As we had but one Sufficent toe roap and were obliged to employ the Cord in getting on our Canoes the greater part of the way we could only take them one at a time which retarded our progress very much. by evening we arived at the portage on the N. Side [Fort Rains] where we landed and Conveyed our baggage to the top of the hill about 200 paces distant where we found [formd?] a Camp. we had the Canoes drawn on Shore and Secured. the Small Canoe got loose from the hunters and went adrift with a tin cup & a tomahawk in her; the Indians Caught her at the last Village and brought her up to us this evening for which we gave them two knives; the Canoe overset and lost the articles which were in her.—.